Mustangs FC is surely a melting pot of media-friendly affirmations -yet it manages to rise above them all to connect at a more base level of heroic and warm characters overcoming obstacles. 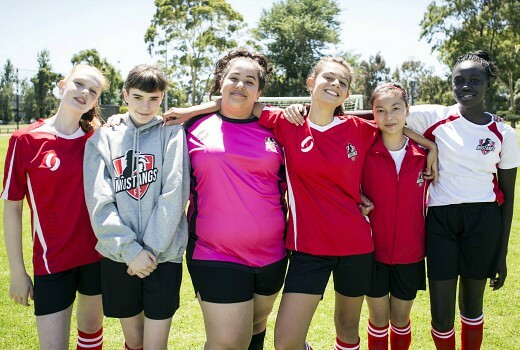 Ticking the boxes for female sport, multiculturalism, body image, (dis)ability and self-esteem, the ABC ME series centres around teen striker Marnie (Emmanuelle Mattana) and her BFF Liv (Ashleigh Marshall). Both are the heart of the newly-formed Mustangs FC, a team of misfits and ring-ins mustered by the determined Marnie. She plans to prove her mettle against rival team the Wildcats, but will need to dig deep. The Mustangs have no uniforms, not enough members, are forced to use the boys change-rooms and are trained by Marnie’s mum Jen (Pia Miranda). On the home-front Jen is dating single father Kev (Stephen Hall) whose ribbon-twirling gymnast daughter Lara (Monique Heath) has no time for the grunt of soccer, making romance somewhat difficult for their parents. But worse is to come for the girls with a suggestion that they all move in together. Meanwhile Marnie strikes upon the idea of convincing local milk bar owner Danny (Jacek Koman) to draw upon his Serbian roots and become their new coach -even if it means sacking her own mother. In the lead role newcomer Emmanuelle Mattana is confident and outgoing, buoyantly matched by fellow newcomer (there’s quite a few here) Ashleigh Marshall. They ably keep the ball in the air, pun intended, in the debut episode. It’s also good to see character actor Jacek Koman afforded a key role. Without quite straying into tomboy areas, the series by producers Amanda Higgs & Rachel Davis, works to empower its target audience. “One day I want to play for the Matildas,” insists Marnie, who also expresses no desire to settle for netball. The series features a narrator, courtesy of Celia Pacquola, who is prone to asides, humour and plenty of teen lingo: OMG, Spoiler Alert etc. The synth music soundtrack is a little overt, and things open with some derision towards female gymnasts, but these are minor quibbles in what is a bright start as a female-friendly kids series. It doesn’t always have to be about dance class and pony clubs. Mustangs FC premieres 5pm Wednesday on ABC ME.